We offer a complete line of drinking water systems to supply clean, great tasting water in any environment or to treat any water condition. We use the latest technology of Waterlogic to tailor a solution for your exact needs. We offer a combination of micro filtration, reverse osmosis and ultraviolet disinfection to deliver safe, great tasting water, all without overbuilding an expensive solution that you don’t need. 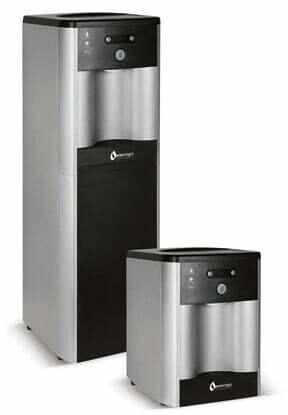 The WL250 delivers on a promise of endless refreshing chilled water for your workplace. It features multi-stage filtration and ultraviolet light sanitation to reduce bacterial growth and prevent potential biofilm buildup. The business friendly design and guaranteed reliability ensure you have all the quality cold and hot water your employees and guests need. Bottle-less drinking water technology means no more deliveries of bottles, and no more lifting and storing of heavy 5-gallon bottles. Waterlogic systems are designed to plumb into existing water lines and use modern technology to treat water, on site, at the point-of-use. With Waterlogic systems, there are never any bottles to lift, store or replace. This reduces the risk of lifting injuries and workers’ compensation claims associated with heavy bottles. To save you time and money, periodic preventative maintenance is performed according to Waterlogic’s strict protocols, by a qualified service technician. Bottled water coolers have exposed reservoirs that can become contaminated if not sanitized on a routine basis. Someone’s hands may be dirty when they are handling and changing bottles. Offer your employees better protection from bacteria with a self-contained, point-of-use system. Many companies today are focusing on building security. By decreasing the number of unauthorized personnel on your premises, you are contributing to the safety and well-being of all associates. Additionally, you’re not blocking entries with delivery trucks, nor using up valuable space by storing water bottles! Bottle-less technology is environmentally friendly. According to the World Wildlife Federation, the conservation organization, bottled water puts 1.5 million tons of plastic into the environment, worldwide, each year. By changing to a point-of-use system, your company is doing something better for the environment by reducing waste. An economical Waterlogic system can save money and reduce billing-related hassles. With a Waterlogic system, there’s a level payment plan every month, regardless of usage. If you’re charged with managing budgets while being accountable for quality, Waterlogic water systems are right for you. Click your preferred contact method below. We will respond to you within 24 hours.